Cycloidal drives combines a compact cycloidal input gear set with a slow speed helical output gear set to provide an extremely efficient, quiet and durable gearbox. 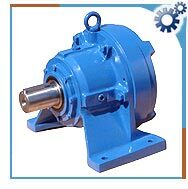 It consists of high-speed shaft with eccentric bearing assembly and a slow-speed shaft assembly. It also has cycloid discs with one less lobe than the ring gear pins. The ring gear roller and pins are fixed. The term cycloidal is derived from hypocycloidal, which is defined as the curve traced by a point on the circumference of a circle that is rotating inside the circumference of a larger fixed circle. A common example of this is the path traced by a tooth of a planetary pinion rotating inside a ring gear. The high-speed shaft turns the cycloid disc around the internal circumference of the fixed ring gear. With each turn, the cycloid disc advances a distance of one lobe in the opposite direction of the ring gear. The cycloid disc transmits their movement to the slow speed shaft. The pins are projected through the cycloid disc bores. Cyclo drive provide an efficient and durable transmission system with a shock load capacity of more than 500%. There are several disadvantages also. They exhibit speed and torque ripple because of their methods of transmitting motion. The eccentric motion inside the drive translates into ripple and is evident at slow speeds. This is problematic in industries requiring smooth motion. They cannot effectively achieve ratios below 50:1. They have low torsional stiffness. They have higher initial cost and higher operating maintenance cost. Heat generation, attributes to mechanical losses and the power being transmitted is readily dissipated through a smaller housing surface area. Cyclo drives are designed to suit various applications. They are used in boats. These drives orient their propeller blades vertically and generate lift over lift over them. The vessels of these drives have comparatively deep drafts; they are less suitable for shallow water. Cycloidal drive had generally proven themselves to be extremely robust and reliable in this industry.